Spring Creek Laundry and Dry Cleaners is a full-service laundromat and dry cleaner located in Columbus, OH. We aim to simplify the clothes washing process for our clients through comprehensive laundry and dry cleaning services. The Spring Creek Laundry and Dry Cleaners facility is state-of-the-art. We have top load washers for small gentle loads as well as Maytag Neptune Front Load washers for larger loads and those in need of a different wash action. Our laundromat is also equipped with multi-load 30- and 50-pound washers for really large loads. These large washers are designed to handle comforters, rugs, pillows, bedspreads, and sleeping bags. We also have dryers with a new airflow design that can dry clothes gently yet quickly. In addition to our top-of-the-line equipment, our laundromat also has a lounge area with magazines and reading materials, snacks, soft drinks, two televisions, and internet service to keep you preoccupied while we handle your laundry. We also have a kids’ area, ample parking space, and an attendant on-duty at all times for your convenience. 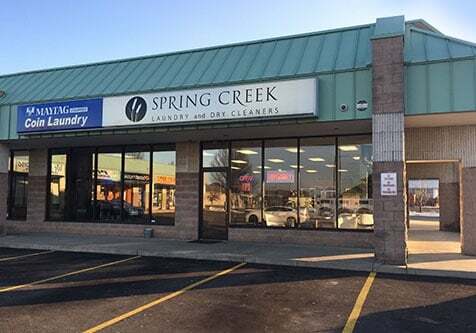 Spring Creek Laundry and Dry Cleaners is dedicated to being Central Ohio's finest coin laundry and dry cleaner through our friendly staff, clean facility, and professional service. After choosing to entrust your laundry needs to us, you can be confident that you are in good hands. If you have questions or comments about our laundromat and the laundry services we offer, don’t hesitate to get in touch with us.